A classic color combination for a classic style, black and white headboards work wonders for creating and finishing off beautiful, modern bedrooms. Big or small, for platform or box spring beds, DIY or bought straight from the store – we’ve rounded up some sleek, real-life headboards to inspire you and to get your chic, sleek decorator wheels turning. One thing I like about these colors is that they are so neutral and they fit so well together. Good neutral bedroom designs are easy to beautify by introducing more color through paint, accents or artwork. The great thing about the added color is that it does not clash with the black and white headboard and usually draws the eye to added colors. If you like patterns but are scared to overwhelm yourself and your room with them, try something simple yet bold on the headboard. Polka-dots, checks and thick plaids are all ways to stay fresh and in the now without cluttering a clean space. Blacks and whites won’t be too harsh on the eyes and the pattern is in a small enough spot not to cloud the theme or look of the room. Use a clean print like chunky stripes for a bold, yet simple and contemporary vision. Sleek doesn’t necessarily mean straight edge, shiny or lacking in artistic vision. 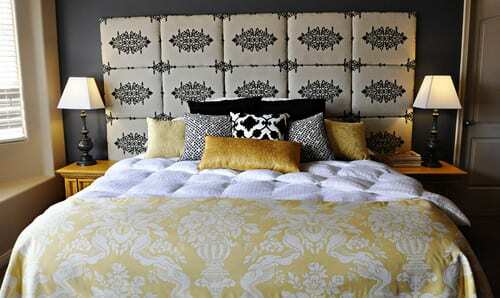 Instead, you can use upholstered headboards you find at your favorite store or DIY them yourself! Damask prints, toile, and intricate geometric patterns can look and feel super modern and fresh when dipped in blacks and whites opposed to lots of bright and vivacious colors. Using this classic, the neutral palette will keep with the contemporary goal and not stray from a 21st-century style. This black and white towers over the whole bed. You cannot miss it. If you’re looking for a tone that’s trim and fit but still soft on the eyes, why not try a tufted piece? It’s traditional but combined with this chic color combo you’ll get something with lots of texture in your fashion-forward bedroom. 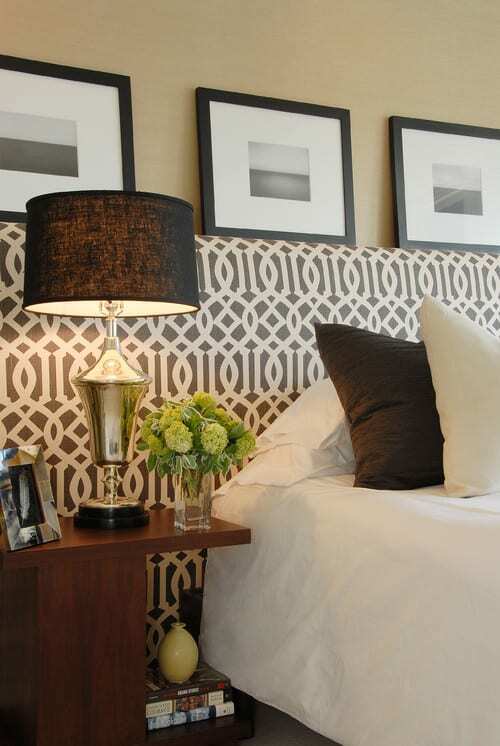 Use a black foundation to make the white or cream fabric pop right off the wall. It will surely add depth and it’ll be the sleek style you’re searching for. For an extra bit of personal design, add your own buttons to the puckered spots! Creative, outside-the-box ideas aren’t limited to more eclectic styles and decor. DIY, unique ideas can be just sleek. A coat of chalkboard paint with some of your own handwriting is a chic, yet personal touch on a contemporary bedroom. And it’s so easy, even a novice crafter can put it off. Even if you have some old wood palettes or a headboard in desperate need of an update, this is an easy way to create something upbeat and modern.